This is an unexpectedly impressive dish for what basically boils down to an Asian vegan pasta salad. It is perfectly balanced and even can be considered healthy by at least a few definitions. 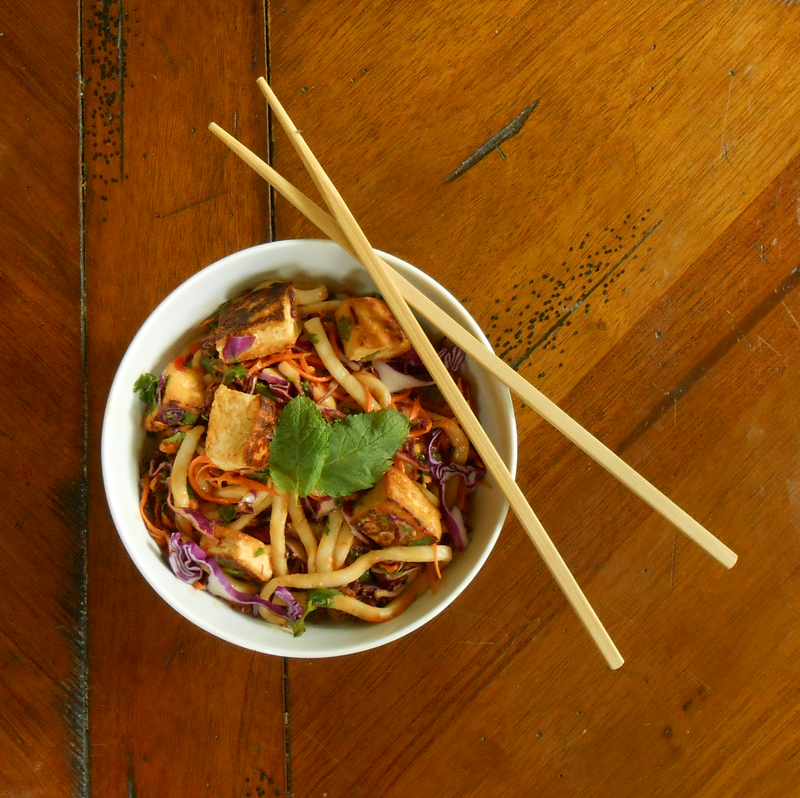 What elevates salads to complete meal status is a panoply of sensations in one chopstick-ful: warm tofu, cool noodles, crunchy vegetables, and bright herbs. The rich peanut sauce, too intense to use as a regular dipping sauce, brings just the right amount of salt and heat for a big bowl of otherwise plain noodles and raw vegetables. 1. Cook the udon noodles according to the package directions. Drain and rinse with cold water until cool. 2. Heat oil in non-stick pan over medium-high heat. Add tofu and sauté until browned on all sides, about 5 minutes. 3. Whisk together peanut butter, soy sauce, rice wine vinegar, honey, and sambal. If it's too thick, add a little water. 4. In mixing bowl, combine vegetables, herbs, tofu, udon noodles, and sauce. 5. Separate into bowls. Garnish with mint leaves if you're taking a picture.